Reading through my emails I saw the latest e-newsletter from one of my favorite sites and a special section on great summer drinks. Since my husband and I rarely drink, when we entertain we are sadly naive when it comes to 'fun' drinks to serve. When I saw the name of this drink I had a brief second of "oh, ew? Really?" followed by interest and I admit, I'm intrigued! 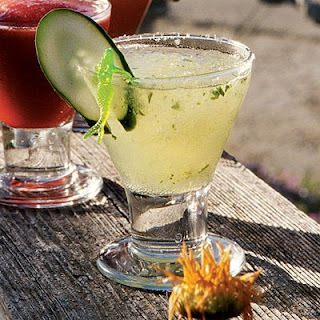 See if you are; Cucumber Margarita's. Crazy isn't it? This one is from Coastal Living, back in September of 2005 but by golly I was surely going to copy it down to my collections to make this summer. What do you think? Combine cucumber and next 4 ingredients in a blender; process until smooth. Pour into glasses. Top each serving with a tablespoon of Grand Marnier, and garnish with lime.